All transactions are safe and secure with a reliable history in online purchasing behind each of our associates. 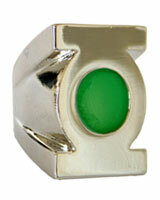 Buy the Hal Jordan Power Rings, Green Lantern Metal Power Ring Replicas to own Green Lantern clothing and merchandise. Join the Corps with one of these official Green Lantern metal power rings. The silver replicas come in seven different sizes, which allow them to accommodate fans of nearly any finger size. This costume accessory has a metal base with silver plating that gives it its shine, which contrasts nicely with the green enamel center. Harness the power of Hal Jordan with this silver Green Lantern metal ring. This replica is a nice ode to the Oath and character. In addition to the Hal Jordan Power Rings, Green Lantern Metal Power Ring Replicas above, browse the Green Lantern Clothing Gallery for more apparel like men's and women's clothes, kids shirts or hoodies.